I am so excited to bring you my first Monster inspired treat for Halloween! I always love seeing all kinds of Monsters treats and desserts on the Internet, and I’ve been meaning to do one for the longest time. So I decided I would wait no more and this would be the year. These designs are inspired by a combination of many monster treats I’ve seen everywhere. These Chocolate Covered Monster Cookies are super easy to make and take only a few ingredients. 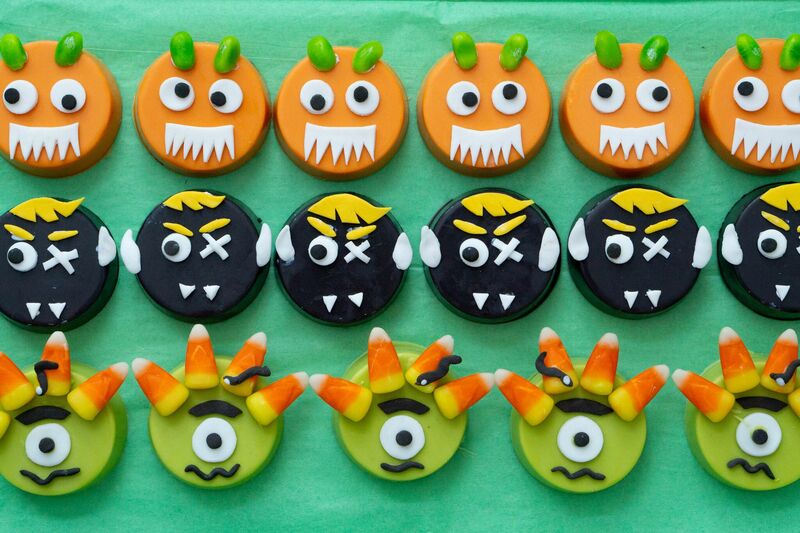 I made three different designs: The Green Cyclops, with Medusa hair; the Black Dracula, crossed with Frankenstein and the Orange Googly-Eyed Bug with scary teeth. 1. Melt 2/3 of a bag of chocolate chips as per instructions. Pour one large spoonful into mold cavities. Place Oreos in the middle. Pour another spoonful until the cavity is full, but don’t overfill. Tap it a few times. To get rid of bubbles and clean all excess. Place in the fridge for at least 3 hours (I prefer to leave overnight). 2. When you are ready to take them out of the mold, flip over onto a tray and the cookies should snap right out with a little push. If they don’t, they are not ready and you should put them in the fridge for at least 30 more minutes. The cookies should be shiny when done. 3. Repeat with all 3 colors. 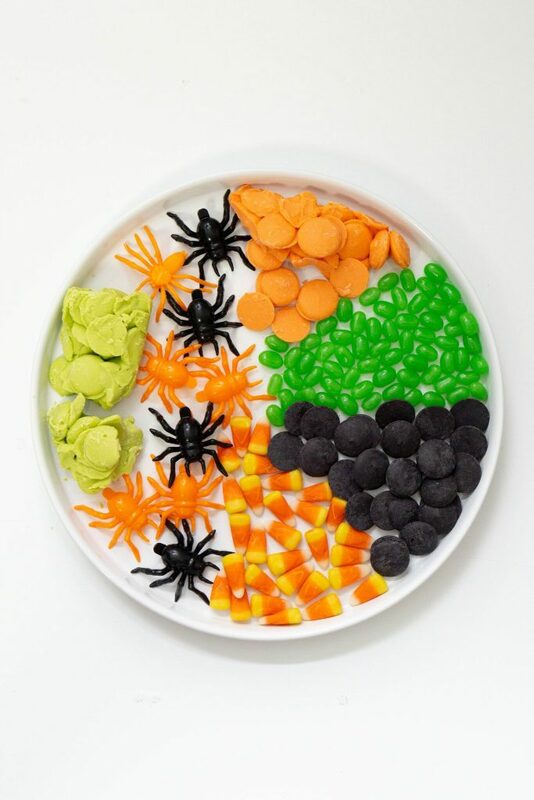 You should have 6 cookies of each color. Roll out white and black fondant to less than 1/8th inch thick. Cut out the white eyes using the wide part of Wilton 10 tip. Cut out the black part of the eye inside using the narrow part of the same tip. Using the fondant scissors cut out a large eyebrow. Roll a small snake for the mouth and one even smaller for the hair snake. Add a tiny white fondant dot for the snake’s eye. Using white melted candy chips as glue, attach the eye to the middle of the cookie. Using melted candy chips as glue and with the small brush, attach the inside of the eye, the eye, the eyebrow, and the mouth. Add 4 candy corn pieces as hair. Finally, glue the snake onto one of the candy corn pieces. I found this one to be the hardest to work with because the face pieces were so small. Roll out yellow, black and white fondant to less than 1/8th inch thick. With the scissors, cut out a piece of the yellow fondant to make it look like front bangs. Also, roll out two tiny balls and shape into eyebrows. Now with the white fondant, cut out two tiny triangles, these would be the fangs. Roll out 2 balls and shape into pointy ears, a cylinder first and then shape one end thin and pointy and the other rounded and wider. For the scarred eye, roll out two tiny balls into tiny snakes and then flatten with the roller. Cut off the ends straight. Cut out the eye using the narrow part of Wilton 2A tip. Also, cut out the black side of the eye using the narrow side of Wilton 10 tip. Very patiently and using the smallest brush and melted candy, glue the hair, the eye, the criss-cross scarred eye, the ears, the eyebrows, and the fangs. Roll out white and black fondant to less than 1/8th inch thick. Cut out the white part of the eyes using the narrow part of the Wilton 1A tip. Cut out the black part of the inside of the eye using the narrow side of Wilton 10 tip. Cut out a rectangle to be the size of the mouth. Cut off the top in a curve and cut out thin triangles at the bottom to form creepy teeth. Cut the green jelly beans in half to shape the bug antennas. Glue everything with melted candy. Don’t forget to glue the black part of the eyes in different directions to make them googly. 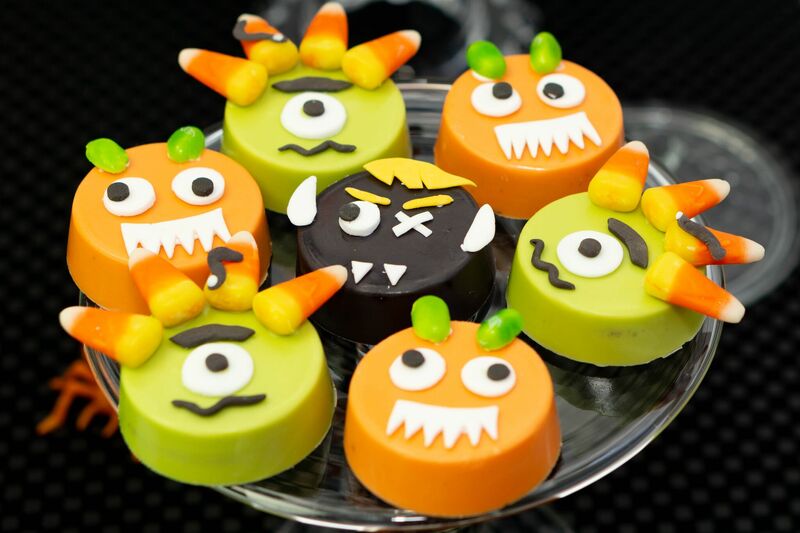 Share with your friends and family or make them part of a Monsters Candy Bar like I did. Making these was so much fun and you can totally have your kids help! 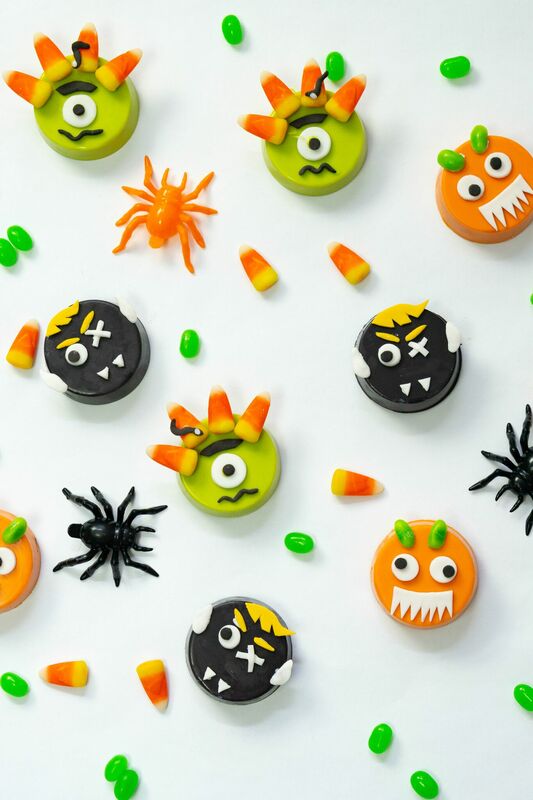 Don’t forget to share photos with us if you were inspired to make the Monsters Chocolate Covered Oreo Cookies.